Edmond H Fischer is a biochemist best known for his discoveries concerning reversible protein phosphorylation as a biological regulatory mechanism, for which he and his collaborator, Edwin G Krebs, received the 1992 Nobel Prize in Physiology or Medicine. Since 2007 he has been Honorary President of the World Cultural Council and presides over their Directive Board. He is a Director of the Bert L & N Kuggie Vallee Foundation. Dr Fischer was born in Shanghai and educated in Switzerland. He completed a PhD in organic chemistry at the University of Geneva under the supervision of Kurt H. Meyer. In 1950 he moved to the United States, first to the California Institute of Technology and then, as an assistant professor, to the University of Washington, Seattle, where he has remained ever since. Within six months of his arrival in Seattle, Eddy Fischer and Ed Krebs had started to work together on Glycogen Phosphorylase. They continued to work closely together while maintaining separate groups. Dr Fischer’s group has been mainly concerned with the regulation of cellular processes by protein phosphorylation, particularly tyrosine phosphorylation. Tyrosine phosphorylation has been implicated in cell growth, proliferation, differentiation and transformation initiated by tyrosine kinases of cellular or viral origin, or linked to hormones and growth factor receptors. With his collaborator Nick Tonks, Dr Fischer isolated the first tyrosine phosphatase. 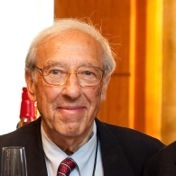 In addition to his Nobel Prize in Physiology or Medicine, Edmond Fischer has received the Werner Medal from the Swiss Chemical Society, the Lederle Medical Faculty Award; the Prix Jaubert from the University of Geneva and, jointly with Ed Krebs, the Senior Passano Award and the Steven C. Beering Award from Indiana University. He has received multiple Doctorates Honoris Causa and is a member of more than a half dozen science academies including the National Academy of Sciences and the Royal Society. Here Edmond Fischer tells an engaging story of how he and Edwin Krebs were the first to observe reversible protein phosphorylation, a mechanism so ubiquitous, it influences almost every cellular process.